September 2010, springtime at Mooseys, started off with an earthquake of magnitude 7.1 on the Richter scale, followed by lots and lots of aftershocks. Not the best time for young first-time ewes to have their lambs. On the third morning after, two abandoned new-borns needed rescuing. The boy lamb was strong and furious - where's my food? 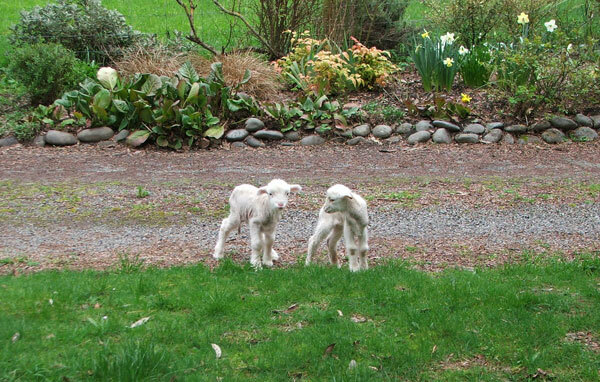 He was bleating his disapproval, running along the paddock fence by the driveway. The girl was a runt, and couldn't stand up - she was in serious trouble. We carried the lambs to the Stables and set up the lamb creche (a netting cage filled with dry straw bedding). Boy lamb instantly adapted to being a pet lamb, but girl lamb was difficult. I had to force her mouth open to take the teat - unpleasant but necessary. She did drink little amounts on her own, though. Those first few days were very worrying. But she got slowly stronger. I couldn't name the pet lambs until they'd got through their first week - and it took a whole week for little girl lamb to come right. Finally at nine days she was feeding properly, standing up to take her bottle. Girl lamb is called Milly - she's a sweetie, who rather enjoys a cuddle. Her ears are floppy, with ginger-brown tips, and her wool is very soft and white. Maybe those first memories of being grabbed, restrained on a lap, and fed have made a strong mental imprint on Milly. Since those worrisome early days both lambs have gone up several sizes! Their routine is rather specific because Milly is still so small - six or more feeds a day, plus top-ups, with intakes monitored carefully. Stu lamb always gets a bigger bottle, but he mustn't be overfed. The holes in the teats are quite tiny, making the lambs work hard for their milk. This is much safer for Milly. Both lambs have had their tails 'ringed' - this is best done when they're small. And sorry, Stu, but your future is not to be the next Moosey ram. My spell-checker still insists on calling you 'Stud lamb' - sorry about that! 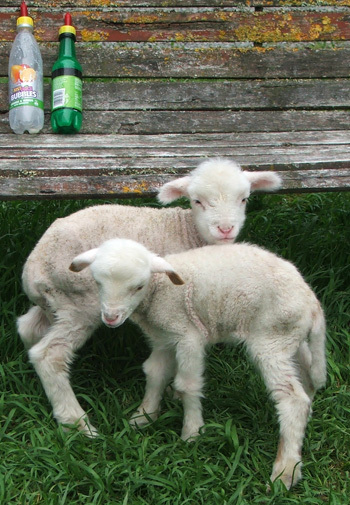 Morning tea with lambs is taken on the garden bench overlooking the Frisbee Lawn, followed by a walk around the grass. Fluff-Fluff the cat comes too and smooches the lamb noses, while Rusty the dog licks up any milk drips. The lamb feeding roster involves the whole Moosey family. Huge thanks to Sharnae who always does the late night feed. She's been brilliant with little Milly. Non-Gardening Partner and Son of Moosey are often dragged out to hold the torch. Then Mother Moosey drags herself out of bed each morning at 6am for the first feed of the day. Lucky lambs? I'd much prefer them to be with their mothers. But then Milly wouldn't have survived. If both lambs had been strong and healthy I could have tried penning them with their mothers to force some bonding. But I figured that the continuing aftershocks were confusing the natural order of things. Even sheep have feelings! 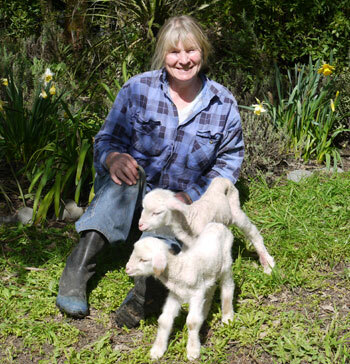 So welcome to Mooseys, Milly and Stu - two woolly merino reminders of the 2010 earthquake! I'm sorry to report that Milly the lamb didn't make it past three weeks. I so enjoyed looking after her, and I did all I could. 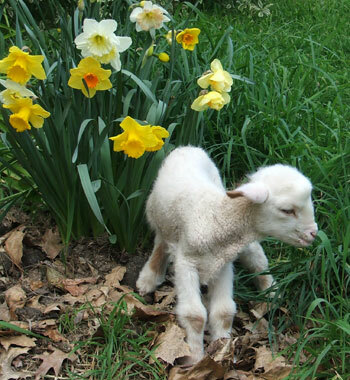 Dear little lamb! I guess we both tried our best.